The most famous Newfoundland dog stories invariably bring a tear to the eye. Most of us know that the Peter Pan dog was Luath, the Landseer Newfoundland owned by the author, J.M. Barrie, but other newfies have gone down in history for their loyalty, courage and endurance. Let us not forget Seaman, the black newfoundland dog who went on the Lewis and Clarke Trail in the early nineteenth century. 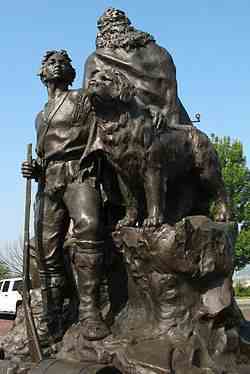 This is the monument to Seaman which stands outside the Custom House in Cairo, Illinois. Or Gander, who gave his life to save Canadian soldiers from a grenade thrown by the Japanese enemy. Lord Byron's inscription on the tomb of his beloved Boatswain, is well known. The Newfie has been famous throughout history for his courage and endurance, for his sweet, gentle nature, and for his loyalty. The Landseer newfoundland got his name from the many paintings of the dog by Sir Edwin Landseer. Many people have trained newfies as assistance dogs and one local one to me was reported as doing all the washing for his disabled owner. He would put the machine and detergent in the front-loading washing machine, switch it on and when it was finished, drag it out into a basket and load it into the dryer, which he also turned on. Once finished, he would unload it into a basket. Then he would help his wheelchair bound mistress to fold it. What an amazing dog! In more recent years there has been Bilbo, the lifeguard newfie who works with the lifeguards on the coast of Cornwall, in the west of England. Do you know any Newfie Stories?